At this point, having already traveled about 15 km, the path winds around the broad and sunny Val di Chiana [Chiana Valley] faithfully following the banks of the Canale Maestro. It then soon reaches the villages of Acquaviva and Montepulciano Stazione, while, a little way away, you can see the outline of the hamlet of Montepulciano. Shortly after the 20 km mark, the path almost brushes against the Callone di Valiano, an important 18th century construction built to regulate the flow of the waters coming from the lakes of Chiusi and Montepulciano. The barrier, in the case of flooding, made this stretch of the Canale Maestro possible to be navigated. You continue pedaling in the heart of the alluvial valley at the foothills of the hamlet of Valiano (to the right) passing by the “Torrione” built in 1740 to enable the hydraulic experts to observe and keep an eye on, from up above, the works being carried out on the reclaimed land. 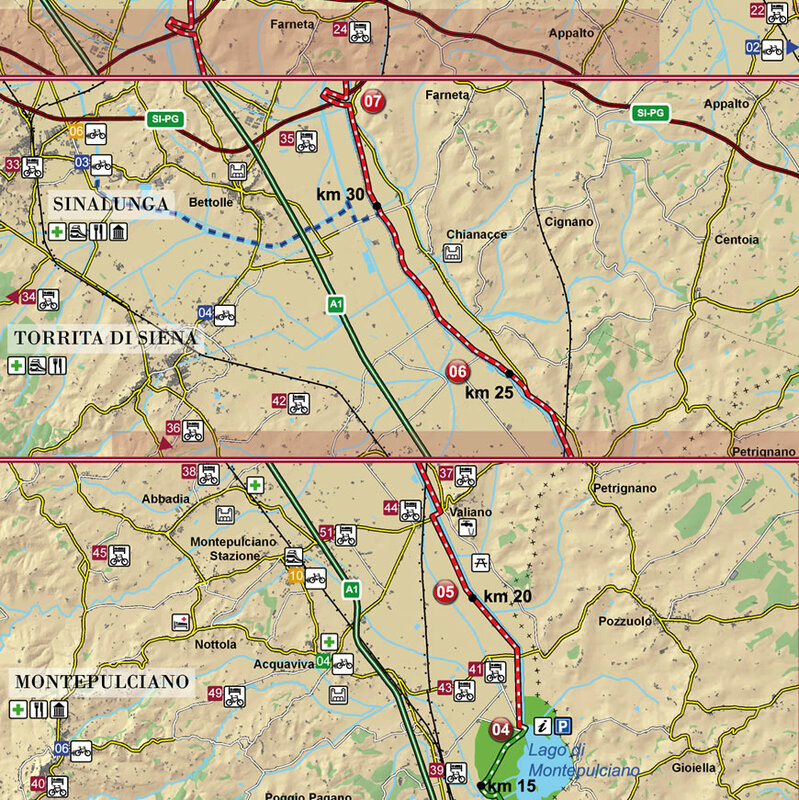 The final stretch of the Sienese Val di Chiana passes between the areas of the Chianacce to the east and Torrita di Siena and Sinalunga to the west, to then reach the area of Foiano della Chiana, a hamlet which is easy and quick to reach from the cycle path. Shortly after the 35 km mark, you cycle along near the Botte allo Strozzo, a brilliant piece of hydraulic engineering where the waters of the ”allacciante delle [connecting waterways of the] Chianacce” cross over the Canale Maestro to then flow into the ”allacciante di sinistra”[connecting waterways to the left].